my blog’s been a little wonky the past few weeks, with technical weird things and no time to figure out why people aren’t getting email posts and formatting’s off. when i was reflecting on this thanksgiving week, this old post from sheloves magazine came to mind, part of the down we go column i write once a month. some of the thoughts originated from a november synchroblog a few years before that called sitting-at-the-rickety-card-table-in-the-family-room-for-thanksgiving-dinner. this past sunday night was our 8th annual refuge thanksgiving feast together. as we gathered around a room full of big tables in our new space, kids and grownups of all shapes & sizes & experiences, and held hands and shared what we were thankful for it felt like a little taste of heaven–no one at the rickety card table in the other room but all together at the big table, each voice valued and loved. it was so pretty. i thought i’d share here as part of thanksgiving week. i like thanksgiving because all my family & friends come over for a big dinner, but the truth is i also know so many others who are struggling this holiday and dreading the season. i strongly believe that part of the deep loneliness that sets in around this time has to do with small tables & the damaging disconneectedness it brings. more on the realities of the holidays next week. meanwhile, i do pray for bigger tables where everyone eats. enjoy the capital letters and happy thanksgiving week! enjoying my kids home & back next monday. In my current life situation, I am not marginalized in many ways. I am married, white and have a graduate school education, health insurance & a host of other privileges. However, we all have our bumpy stories, and when it comes to being a female lead pastor from an evangelical world, I know the feeling of sitting at the card table in the family room while a whole bunch of men are eating at the fancy table. It’s a very inadequate feeling. And while over the past few years I have come to accept its realities and lean on the wonderful love and acceptance I do have (and now, honestly, I’m having way more fun sitting at the card table) it still feels sad to me–the subtle segregation, the power differentials–especially in the kingdom of God. Many people I know are used to sitting at the card table. They’ve always lived on the margins socioeconomically, practically, spiritually and in all kinds of other ways. They’ve never been invited to the big table, ever. They are used to eating scraps and being satisfied with anything they can get. And I do mean big. Our tables should have room for everyone–the fringers, the lonely, the doubters, the certain, the poor, the rich, the educated, the uneducated, men, women, gay, straight, black, white, brown, young, old, liberal, conservative and everything in between. When there’s not enough room at the current one, we’re supposed to get up and find some leaves and pull up as many chairs as we need. And I don’t think the big fancy one is supposed to be the centerpiece. In fact, I think what’s supposed to happen is everyone who’s been used to the fancy table needs to get up and go sit around the card table and listen to the conversations there. To eat on a plastic plate for a while and use a paper napkin. To listen, learn and find that even though we seem so different, in the end we’re all really longing for the same things–to love and be loved, to give and to receive. Maybe, over time, what will happen is those two tables–and all the other kinds that seem to segregate and separate us–will somehow be muddled up and combined, chairs shifted around, the china mixed with the plasticware and all the neat and tidy decorations can become not so neat and tidy anymore. We have much to learn about how deep the grooves are in the culture we live in, not just in the world, but also in the church. Since the beginning of time we have been divided and segregated. Power has been held in the hands of people who have not done well at distributing it. Dignity has been stripped, voices silenced, pain minimized and poverty perpetuated. The only way out, in my opinion, is through brave and wild steps taken in Jesus’ love–in actions not words–to shift the dynamics of the table and diffuse power in new ways. This will take humility and courage for all of us. It will take prayer, asking God to show us where we fit into the change. Do we need to make more room at our tables? Do we need to be the ones to throw new parties with new people who need to begin to know each other despite their differences? Do we need to bravely pull up a chair and participate in conversations we’re not used to having? Do we need to be the ones who scooch the different tables together and start passing out food? A life of downward mobility means that we can’t keep sitting at fancy tables while our friends are at rickety card tables. 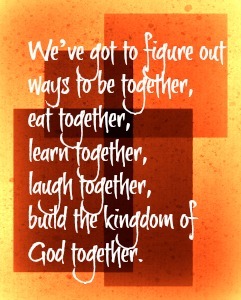 We’ve got to figure out ways to be together, eat together, learn together, laugh together, build the kingdom of God together. So, that’s my hope as we enter into this season of holidays and feasting: that we’d not just dream about them, but actually work at setting wild, crazy, beautiful, eclectic tables of all shapes and sizes where there’s room for everyone. That the people sitting there are humble, spiritually poor and ready for some really good food–the kind that only tastes good when it’s shared together. “I know the feeling of sitting at the card table in the family room while a whole bunch of men are eating at the fancy table. It’s a very inadequate feeling”. Yes, and I feel not dissimilarly in the company of anyone who says “Jesus is a feminist” or and treats me with the assumption that because I am heterosexual, male, white, western and with an education that I always hold power and privileged. I have found that in such circles, I cannot push back about feeling of “inadequacy” or even share feeling that way without being met with resistance, disrespect, repulsion even. The best I can do to be accepted is to aplogise if I have done anything appropriate, or to leave and find company where I am welcomed and honoured when what I bring is worthy of respect and not merely “tolerated”. It seems to me that wherever worldly power freedom and independence is preferred over real power, freedom in Christ and interdependence, we will come across such difficulty. That is why I loved the beauty of your book “”down we go” Kathy. I felt like I was not alone last year at a time of difficulty with such issues with the church. I hope that somehow, some way in ways that I cannot imagine God is working to affirm and bring about more of the “wonderful love” that you are talking of and I dare to believe in its emerging ore fully. That where we choose to be involved with that we can flourish and live the fullest lives, whilst not denying th realities of “segregation … power differentials” and having strong and healthy boundaies where such exists. Yes. I love this. Here’s to big tables. I want to sit at the table with ya’ll! I love this, Kathy! This speaks so directly to many conversations I’ve been having recently. I didn’t think the metaphor of the table could be taken this far, but you managed to do it in a really beautiful, powerful way. Happy Thanksgiving to you and yours! thanks, steve. la mesa es grande! Thanks Kathy. Your insight is deeply appreciated. I love sitting with the people at the rickety card table. I’ve met the most amazing people there. I’m am so not interested in the conversations at the big table – their latest cruises, cars and home improvements. I’d rather go to the dump and shoot rats. oh, i am with you. wouldn’t trade the conversations and beauty for anything.